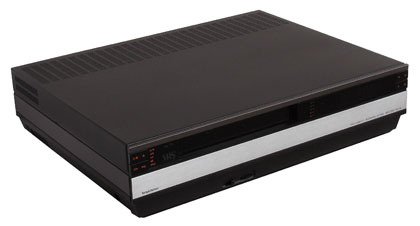 A Hi-Fi version of Beocord VHS 80, still based on a Hitachi machine, this time the VT88. Outwardly almost identical to the more basic model, except for a black line and the words “high fidelity recording system” across the aluminium door. Initially sold as a “complete recording machine”, as it could record 4 hours of television or 8 of high quality audio, comparable in performance to the best Beocord audio models of the period. Linear Dolby stereo recording and playback was also provided, so that stereo television recordings would be compatible with the VHS 80. Though designed to partner the 7802/8902 stereo Beovisions, connections could also be made to a B&O music system via the Tape 2 socket of a Beomaster. Text copyright © Beocentral. Unauthorised reproduction prohibited.